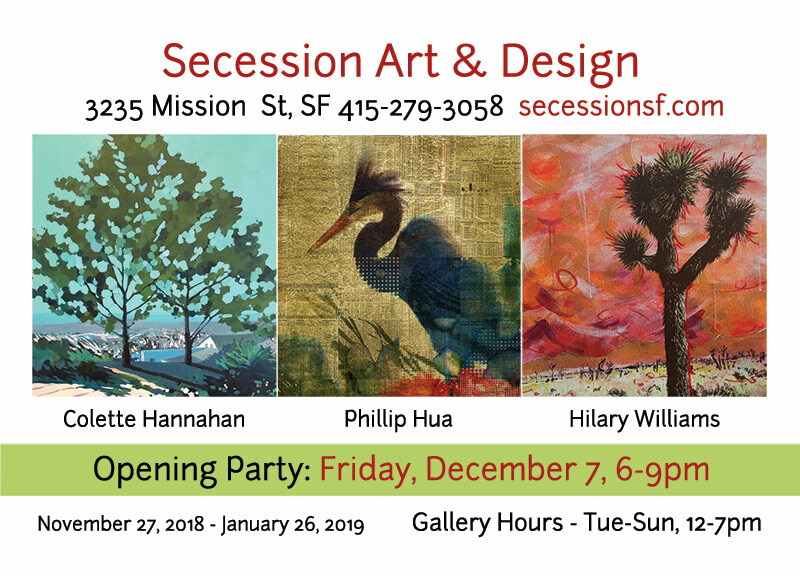 Secession Art & Design's holiday show, Breathe, invites you into the natural and urban worlds of Hilary Williams, Phillip Hua, and Colette Hannahan. The recent wildfires in California taught us to not take life or nature for granted. The smoke has cleared and the rains cleansed the air. Each painting welcomes you into a moment where the artists found peace experiencing wonder in its natural beauty. Please join us on Friday, December 7, 6-9pm to meet our artists, shop our art collection, and celebrate the holidays with a glass of cheer. PS: All art is available for holiday gifting! You can purchase online using in-store pickup.